Thank you for doing this for me..
My wife said thank you also. Hey could you message me? 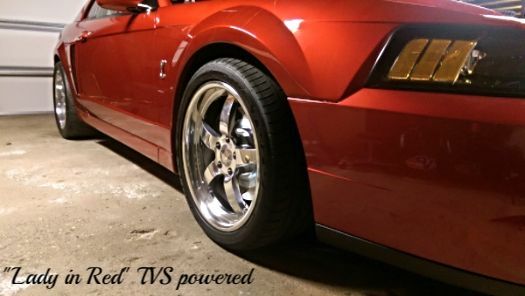 question, i saw your for sale thread searching online and was wondering how much do those tf 16x9.5's weigh (1 rim)? i might be interested if they aren't too heavy. I'm not sure on exact weight, but I can tell you, they are NOT heavy. Yes I have both 92, e70, and e85 tune. You will need bigger injectors, and possibly fuel pumps. When running 92 I put the 3" pulley on. Hey man, I see that your from Minny. I'm looking for Cobra owners around MN to get more involved in the community. I also got a 03 Redfire Metallic Cobra, Just sold my 03 GT your it. BTW nice kill on that turbo hatch. I don't get to many bits around here. Anyway have a good one. Hey I wasn't able to find the pm you sent me sorry man Ive been on Allfordmustangs.com for about three years but I don't know how this site works yet. Hi, I will buy your K&N FIPK. Do you use Paypal or how would you like to go about it? Let me know, thanks. -TVS blower, 21 psi, GT500 TB, BA2600 maf, JLT RAI, Metco idlers, Whipple aux idler, Thump tensioner, Gords H/E, LDC cooling mod, Reiche 170 t-stat. - Deadhead setup, fore level 2, stock fuel rails, AEM 320E pumps, id1000 injectors. - Centerforce twin disc dyad, D&D 26 input shaft, Lethal tob sleeve, MGW shifter, Fiore quadrant/adjuster, MM FLSFC, MM caster plates, H&R race springs, Bilstein b8 rear shocks, LPW diff cover, FTBR diff bushings. WTB: 89-93 foxbody notch. PM if you have something.